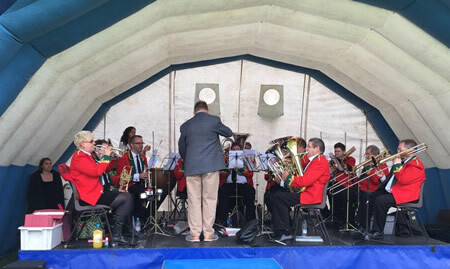 We are a friendly UK Brass Band situated in the village of Marshfield, just a 10-minute drive from the City of Bath. The band has been in existence for over 70 years and has been actively involved with village life ever since. Regular performances are given for village events throughout the year, such as for summer fetes and Christmas. As well as this, Marshfield Brass Band play in various other countywide events. The band practices on Wednesdays from 7.45pm. We practice in the Football Club Pavilion, Withymead Road, Marshfield, SN14 8P. Our Musical director is Mr Pete Boyles who started with the band in spring 2018. Please Visit our gallery to see our latest pictures and information uploaded from our band members!